Pesto can basically be made with any nut or combination of nuts, some garlic, olive oil, and either Parmigiano-Reggiano or Pecorino-Romano or a combination of the two cheeses. Pesto can include sun-dried tomatoes or red peppers. For good pesto you must go to Genoa or learn to make it yourself. The secret is to not over process. Everything except garlic should be bitey rather than the mush they sell in deli departments. Cut off some pieces of Parmesan and process in blender to grate nicely. Set aside. Put garlic in food processor. Whirl briefly. Add pinoli. Whirl very briefly...like one twirl. Add basil and whirl briefly to chop into fairly large pieces. Now process briefly and pour oil through spout at same time. Stop often to check that it is not becoming mush. You are pulsing. Mix in your grated Parmesan cheese by hand. Note: Proportions of oil, basil, garlic and pinoli can vary according to your taste. The technique of blending and the quality of nice fresh basil is what is important. In food processor, combine everything except water. Pulse till finely minced. With machine running, slowly add water until pesto reaches desired consistency. In food processor, combine everything except water. Pulse till finely minced. With machine running, slowly add warm water until pesto reaches desired consistency. This tasty pesto is especially for Thai Steak with Coriander Pesto. Combine in blender with garlic, peppercorns and oil, and process to make a thin paste. Add fish sauce and soy sauce. In a large skillet, saute the shallots in ghee or oil very slowly for about 10 minutes. Do not let them brown. Add the shiitakes, salt and pepper and continue sauteing, stirring frequently Add the soup stock, a little at a time, as you saute. Pour in the cream and simmer gently until sauce is reduced by half, about 15-20 minutes, stirring frequently. Add the tablespoon of Sage Pesto and the small amount of lemon juice. . 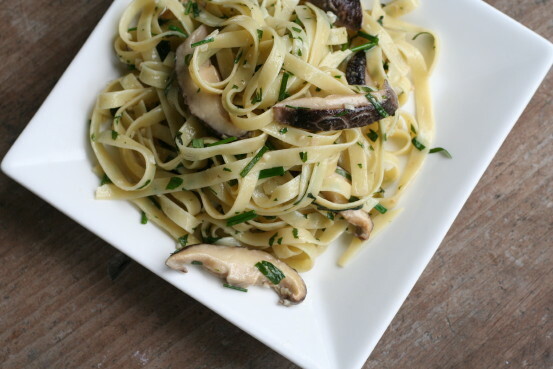 The rich flavors of Sage Pesto, cream, and shiitake mushrooms make a delicious sauce for pasta or spaetzle. 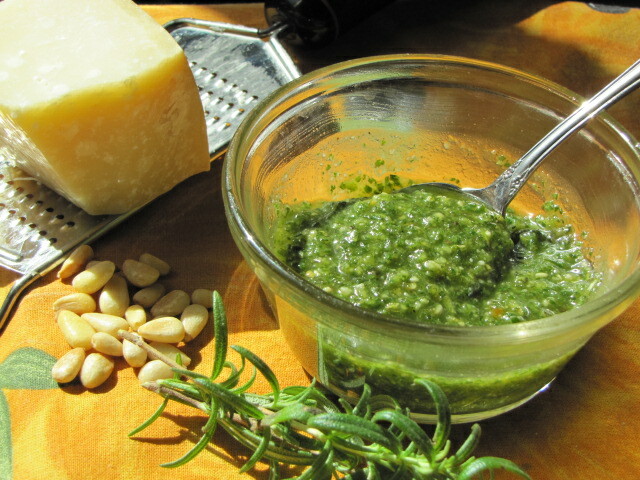 Combine the sage, parsley, garlic, cheese, and nuts in a food processor or blender. Process to mix. With the machine running, slowly add the olive oil. Season, to taste with salt and freshly ground pepper and process to the desired consistency. Let stand 5 minutes before serving. An intense, aromatic pesto. 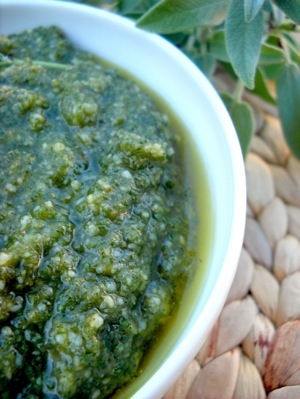 Use this pesto as a sauce or marinade base for vegetables, seafood and lamb. Combine the rosemary, parsley, garlic, cheese, and nuts in a food processor or blender. Process to mix. With the machine running, slowly add the olive oil. Use almost any toasted nuts, such almonds, pine nuts, pecans or walnuts or even pistachio or hazelnuts. Mix lemon peel, parsley, thyme, garlic, lemon juice and pine nuts in blender. Process to mix. With blender running, add olive oil. Season to taste with salt and freshly ground pepper and process to desired consistency. Heat oven to 350 degrees. Heat butter and oil in saucepan; cook green onion and shallot for 2 minutes. Add chopped mushrooms and continue to cook until mushrooms begin to soften. Season to taste with salt and pepper. Layer half the sole fillets in lightly oiled, low-sided baking dish. Cover with green onions and mushrooms. Layer remaining sole fillets on top and cover with foil. Meanwhile, mix pesto with enough cream to make a thick pourable sauce. Cover sole with pesto sauce, return to oven and bake uncovered until sauce is bubbly, about 5 minutes. Mix kale, basil, garlic, cheese and sunflower seeds in blender. Process to mix. With blender running, slowly add olive oil. Serving suggestion: Toss with a firm-textured whole wheat pasta and parmesan cheese. A unique pesto made of sage, basil and walnuts is ideal with noodles, salad or vegetables. Place everything into a food processor or great blender and whirr until smooth. If you want your pesto thinner, add water, 1 teaspoon at a time. "The ingredients may be few, but the result is bountiful. Learn how to make an array of pestos using such diverse herbs as cilantro, rosemary, mint, and lemon thyme. Then enjoy them year-round with more than 30 recipes like Fresh Pea and Mint Pesto Pasta, Red Pesto Ceviche, Tabbouleh with Basil Mint Pesto, and Pesto Frittata." 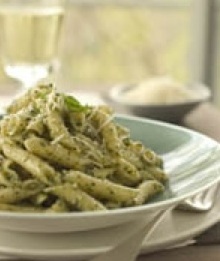 Pesto - you hear that magical word a lot in July and August but not usually in January. Pesto! Cooking with Herb Pastes by Dorothy Rankin (Crossing Press, $7.95), makes an excellent case for winter pesto-dried herb mixtures, moistened with oil and thickened with cheeses, which can be made in November or any month. True, the word pesto is used in the nonpurist sense in this book: Pesto aficionados will argue that only the freshest basil leaves of summer, as well as olive oil, sharp cheese, fresh garlic and pine nuts, make the jade green paste in its one real form. Herb pastes, however, can come in many forms, and if they do not have that characteristic summery aroma, they certainly lend an added dimension to any dish in which they appear. Once made and frozen or refrigerated, the author says, it is easy to add a tablespoon or two to a soup, sauteed vegetables or some other dish in progress. While pesto and pasta make a perfect combination, combined with the juices of meat or fish, pesto makes a marvelous basting sauce. With the addition of a little milk or cream, you have an elegant sauce for pasta, fish, chicken or vegetables. Rankin advises that in making winter pestos, it is crucial to use dried herbs that have a good, strong aroma and are free of woody stems. (Thyme, in particular, should be picked free of stems.) Dried herbs have a short shelf life, six months at most, and should be replenished frequently. The flavor of the winter pestos is very dependent on the quality of the dried herbs. This book is a wonderful guide to making herb pastes as well as to using them in all sorts of interesting dishes. This herb paste can be used effectively as a basting sauce for chicken or seafood. Combined with a little butter, Rankin says, it makes a delicious sauce for vegetables.